Her face scarred by a childhood dog attack, Boston television news writer Alina Carr gets new beauty when an eccentric sire turns her into his vampire daughter. Without the scars on her face, she’s confident enough to take a newscaster’s job in front of the cameras. 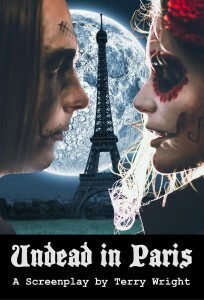 But when she learns she has an undead brother in Paris who’s out to start a war between vampire factions, the new ways against the old, her newfound beautiful existence is destined to be short-lived. She must travel to Paris to stop him before the vampire hunters track them down and kill them all. Her journey brings her face to face with her darkest fear of dogs. Along the way, she’ll learn a brutal lesson: Beauty is fleeting, undead is forever.